As someone who hates to wait longer than 15 minutes for a table when hungry, I am often over-aware of how long it takes to get through a meal. On a good day, we can get through dim sum in about half an hour, if there are only two of us and we don’t spend a lot of time talking. When I had an internship in Vegas, I remember my mom would come pick me up for lunch (it was pretty much dim sum all summer long) and we’d be office door to office door in under an hour. But, dim sum is pretty efficient. Travis and I can get through dinner in an hour, an hour and a half if there are multiple courses being brought out. Dinner with girlfriends can take anywhere from 2 to 3 hours, mostly because of all the catching up we have to do. 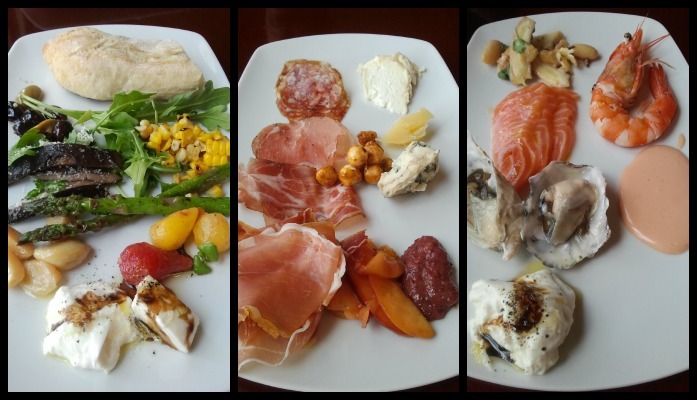 I tell you this because when I hear about a fancy lunch at Vivace at Aviara in Carslbad, a lunch where you could linger and graze and relax for hours on end, I was curious how long Travis and I could really stretch out a meal if we had the time. The Pranzo menu at Vivace is $45 per person and consists of three stations: a crudo bar, salumi bar, and burrata bar. Oysters, poached prawns, cheese and salami, fresh mozzarella a burrata, and a bevy of condiments and tidbits to complement everything. You also get to order an entree (a modestly sized entree, considering all the other treats you’ll be enjoying) and a vegetable side dish. After all that, there’s a dessert bar for grazing. Drinks, coffees, etc are all extra. I’ll tell you right now that I was excited at the prospect of all-you-can-eat burrata and salami and oysters. Cami and I had high tea at Vivace not too long ago (okay, maybe a while ago considering their little cutie is approaching 6 months already) and I thought our tea sandwiches and goodies were fantastic. So, I expected lots of fabulous tasting foods and I really wasn’t disappointed. My one caveat would be to tell you that service matters. By which I mean, who you get as your server will make a huge difference in your experience. At least, it did for me. For some reason, we were in some weird server island where everyone around us had one server and we had someone completely different. The gal who was not our server was energetic and perky (in a good way, not the annoying way) and explained how everything worked to her tables. Half of what I know about the Pranzo lunch is because I was eavesdropping. Our server failed to tell us that, because it was Father’s Day, they were pouring a complimentary glass of prosecco. While Travis was set on ordering a Negroni anyway, I probably would have leaned in favor of a free glass of bubbly instead of a $14 cocktail, had I know that was an option. We were also asked to order our entree at the beginning, which caused it to show up when we were only two plates in to tasting prawns and cheese and cured meats. The other tables around us were advised to order their entrees when they felt ready for it, which helps spread out your meal a bit and then you aren’t faced with juggling entree plates, vegetable bowls, and plates of cheese all on one tables. Because of the way our food arrived, we ended up getting plates of burrata and mozzarella after finishing our entrees but before we had a chance to enjoy any dessert. Our server saw us eating cheese and brought the check, assuming we were one of those cheese-for-dessert people (ha! shows you how well she knows me!) Then, because Travis wanted some coffee with dessert, she had to re-run our check and bring it back. These are little things, I know, but at a place like Vivace I feel like the little things make a huge difference. All I can say is, she’s luck Travis was in charge of her tip. Having said all that, the food was amazing and totally worth going back for. The burrata bar starts with a basket of breads, arugula, corn salad, olives, marinated mushrooms, asparagus, garlic confit (mmm…), and teardrop tomato salad, with the tomatoes all peeled (ooh… fancy!) Then you get to the wonderful man who is making fresh mozzarella and burrata right there. Creamy, soft, fresh cheese, drizzled with balsamic vinegar, olive oil, and flakes of sea salt. I truly ate more cheese than one person should eat in a day. The salumi bar had four types of cured meats, one of which was salami, another of which was a shaved prosciutto, and some others which were fantastic and delicious. Cheese galore, plus little tidbits like candied hazelnuts, pickled peaches, and a fruity mostarda sauce. I’m told the selections change week to week, but I’m pretty sure you won’t be disappointed with whatever’s on the table. Unless you don’t like cured meats. Or cheese. In which case, who are you?? The crudo bar had fresh oysters, Caledonian prawns, poached shrimp, an octopus salad, and fresh salmon. The octopus salad was not to my liking – a little too chewy and fishy for my tastes. The oysters are from Carlsbad Aqua Farm, so they’re the small ones, but very good, if you like oysters (which I do). Between the prawns and the shrimp, the prawns win hands down. You can to pull off the head and shell, but the prawns are about as close to lobster as you can can get. Firm, tender meat with a sweetness unlike any prawn I can remember ever eating. Now, I am a huge fan of raw salmon. When we go out for sushi, I always order salmon nigiri and sometimes it acts as my dessert. This salmon is fresh and melts in your mouth. The fact that it’s drizzled with buttery olive oil and garnished with crunchy salt flakes just makes it that much better. My plate above also has another dollop of burrata, as you can see. We went through the stations one at a time, one plate for each station, the first time. Then I just started picking the things I loved best, telling myself that having to get up each time and walk to the station totally burned off enough calories to justify eating more cheese. 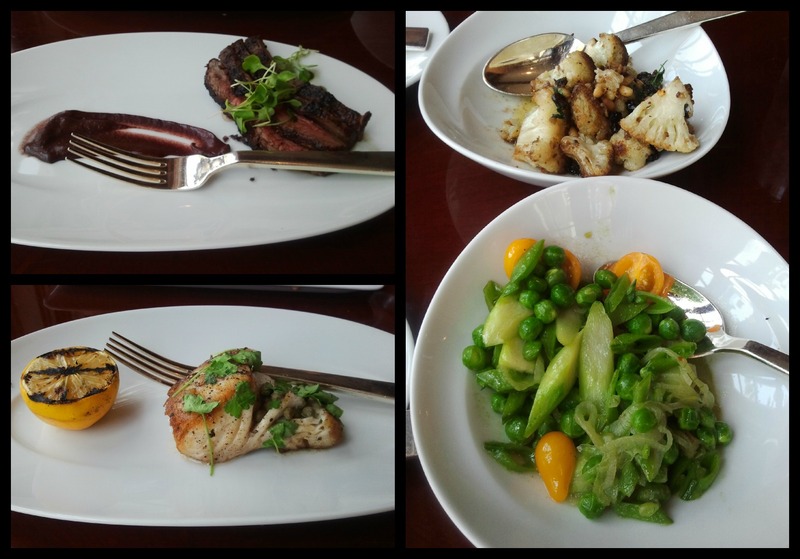 For our mains, I ordered the flat iron steak and Travis got the sea bass. We picked the caramelized cauliflower and english peas as our sides. The peas were good, and tasted market fresh, but it was the cauliflower we both devoured. Crispy on the edges, salty, with a sweetness from the currants, and an extra crunch from pine nuts. It was good. Really good. Travis enjoyed his sea bass, which had a crisp exterior but was perfectly moist and flaky once you got into it. I think sea bass is just not one of my favorite fish. And the flat iron steak? I don’t know how they make flat iron steak as tender and buttery as a filet, but they did. I heard that the rigatoni bolognese is fantastic, but I also know that when we go back, the flat iron steak will be making a repeat appearance on our table. After we finished more cheese (and then, uh, paid the check), we actually sat for a while trying to decide if we wanted more food or if we wanted to wrap things up with something sweet. 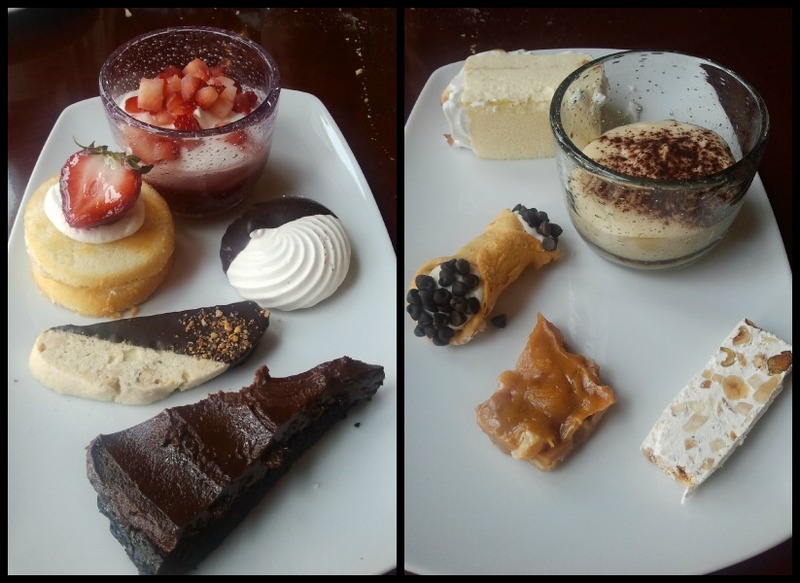 I really thought long and had about it, but decided that I really didn’t want to waddle out of the restaurant, so we went up for desserts and basically got one of everything. The things in glass cups were a tiramisu and something that ended up like a berry tiramisu – regular tiramisu won. The cannoli was okay, but because it had been sitting out, the shell was soggy and half the point of cannoli is the crunchy shell. There was a chocolate cake and a lemon cake – the lemon cake won because the chocolate cake was just an average chocolate cake with frosting. I liked the biscotti because it was crisp enough to survive a dunking in coffee but soft enough to eat by itself. If you’re a harcore crunchy biscotti lover, you might think it’s just a chocolate dipped cookie. There was a nougaty thing and a meringue – Travis enjoyed the meringue as it basically shatters in your mouth and then dissolves away. But, the absolute winner of the dessert table was the macadamia nut brittle that had an extra dosing of salt so you get a salty, sweet, buttery nut bite in your mouth that is fantastic. I went up for seconds of the brittle and slightly debated getting another one on the way out, but didn’t. After our lunch (where we spent a leisurely hour and a half that could have been extended if we had more people to talk to), we walked around the hotel, found the game room, played a short round of shuffleboard and then made our way home. We saw a lot of families with babies there (maybe because it was Father’s Day), so it seems like a very family-friendly spot for lunch, if you think your kids will stay as long as you’re going to want to stay. There’s also a nice patio outside, which would be perfect for babies who may or may not get fussy. We’ll definitely be back to Vivace before the summer’s over. The call of fresh burrata is just too hard to resist. This entry was posted in food, restaurants and tagged aviara, carlsbad, lunch, pranzo, restaurant, san diego, vivace. Bookmark the permalink. Oh man, someone makes fresh cheese for you?! I think I really have to visit this place. Cheese is a serious weakness so it sounds (and looks) so good. Too bad about your weird waitress – service like that can really make the meal kind of funky, but at least there was fresh cheese to console you. If you love cheese (and fresh, soft mozzarellas), you kind of HAVE to try the Pranzo lunch. I mean, it doesn’t get any fresher than that! Plus, there are more cheeses over with the cured meats – hard cheese, soft and stinky, blue cheese… mmm… cheese…. That looks amazing! Is that only offered in the afternoons? I’m going to check out their website right now and see what’s up! Does the $45 INCLUDE an entree (with the 3 stations)? Did you feel like you got your moneys worth? I think this would be such an awesome place to go if you had some time on your hands so you can just lounge and linger in the area to eat as much as possible! The Pranzo lunch is only offered on Sundays and I think they start at noon. The $45 includes all the food (including the entree and side), but none of the drinks. I feel like I got a good value, especially considering a good meat and cheese plate can cost up to $25. Then you have oysters, prawns, fresh raw salmon, more cheese, and a pretty tasty entree. That, and some relaxing (or sun on the patio), all adds up to a pretty good Sunday, I think! I’m going! You had me at the burrata and meats!!! Thanks for sharing. I hope I get a different server! Do you remember her name! haha Just kidding. Or am I?? I don’t remember her name… I think I just put her out of my mind! Luckily, the food far outweighed any of her service glitches. I’ve been so curious about this place! It’s been on my to-do list. Now with your review, I definitely want to check it out. Yay! Do check it out! It’s funny, because of all your visits to Scarpetta, I totally want to go to that brunch! Fresh burrata? I’m in! I purchased fresh day-of burrata from Gioia in El Monte (they provide the burrata and other cheeses for Batali’s Mozza) and it was delicious! The problem was, it ruined all other burrata for me. It’s so good, I think it’s worth missing a day of work to go buy some. I need to check this new place out! Fresh burrata pretty much does ruin you for anything else. It’s been a long time since I’ve run across fresh burrata in a store, but I remember it’s not cheap. You could eat your money’s worth in burrata alone here!